Okay, so for LO's birthday, I've pretty much decided I AM going to make her cake. See, I love to bake and decorate cakes, and I'm all about putting in the effort required (and there is a LOT required) to make something spectacular for a big event like my daughter's birthday. Now, I'm ready for some inspiration. People, there is nothing that says, "A professional did NOT make this cake" like using (and writing on) foil as the base. I'm pretty sure there's a cookie sheet under there. I don't have words for this one. It's like someone skinned Elmo and this is what was left. No fur for you!! This close-up is just too close for my taste. 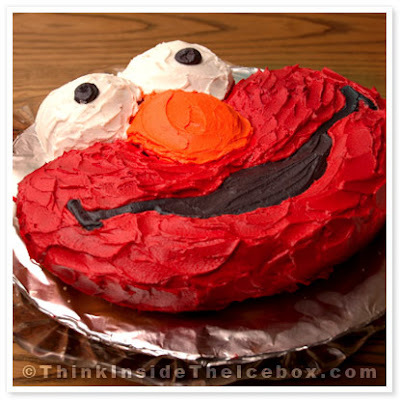 Such an interesting texture for this Elmo, yes? 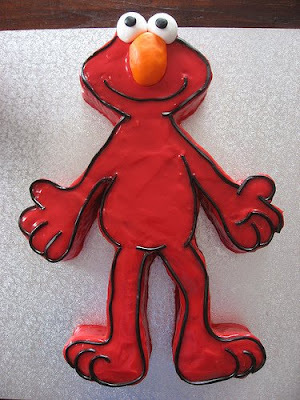 At least he's a bit more proportioned than our skinned Elmo friend above with his big ol' orange nose. But again, with the foil?? Come on. This one probably scares me the most. The blue tint used to outline Elmo? Why? And the writing leaves a bit to be desired. 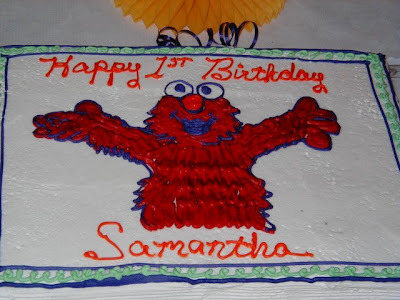 I know I specifically requested there NOT be cursive writing on my daughter's 1st birthday cake. Not that she could read it any better than printing, but I guess it was just principle. So I guess I'm back to the drawing board. 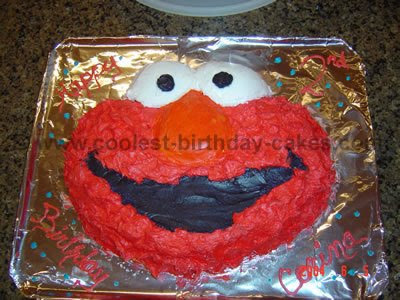 I want to make a cake that includes Elmo on it, but isn't made 100% of nasty red icing. I also wouldn't mind incorporating some elements from "Elmo's World" (like crayons, Dorothy the fish, etc.) since that's where LO's love of Elmo began. I'll continue to scour the Internet for inspiration and will be sure to share any other disasters I may come across for your viewing enjoyment. I can't believe those cakes, and I really can't believe someone would sell them. Having grown up in a house where my mom made and decorated cakes a lot, I can tell you we never saw a cake with foil as the base! I'm sure you will find something. Oh, and I think that Wilton's does make a red coloring for the icing that isn't quite as bitter now. Good Luck!